If you live in Atlanta, chances are you’ve passed the Ponce de Leon Center a hundred times and not seen it. Over the past two decades, thousands of Georgians living with HIV/AIDS have walked into this former church administrative building, donated to Grady Hospital in the early 1990s. A part of the Grady Health System and staffed by Emory doctors and researchers, this clinic serves about 5,200 people. The patients who come here are mostly poor, and mostly minorities, working low-wage jobs and living in unstable housing situations with little access to medical care. Just 3% have health insurance, and some are illegal immigrants. Many already have progressed to late-stage AIDS by the time they make it to the Ponce Clinic, having lived with the disease for many years while it went undiagnosed and untreated. That focus informs both treatment and research. 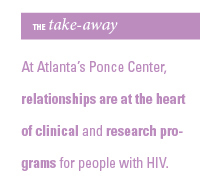 One of the country’s largest AIDS clinics, the Ponce Center is a core facility for Emory’s NIH-funded Center for AIDS Research (CFAR). At last count, the Ponce Center was hosting more than 50 studies, with results of completed research cycled back into the Ponce Center’s plans to improve clinical care of patients. Close ties to staff are encouraged, since research shows that relationships with medical providers can be a deciding factor in health decisions. After all, say staff, helping patients manage their HIV requires not just removing barriers to health care but also supporting clients as they stabilize their lives. A case in point is the on-site Transition Center, a sub-clinic for patients struggling with the triple whammy of HIV, mental illness, and significant substance abuse. 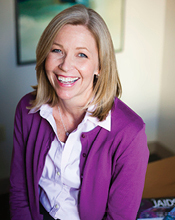 Armstrong and colleagues recently completed a pilot study to see if patients’ health improved when they received the Transition Center’s intensive, flexible, one-on-one model of care rather than standard treatment. The results? Patients’ viral loads of HIV went down significantly. To build on this data, researchers designed Project Retain. In collaboration with the University of Miami, the Ponce Center is creating retention clinics for newly diagnosed AIDS patients. In the clinics, patient navigators will give personal attention and support, helping patients work out logistics of treatment and accompanying them to appointments. Researchers hope to see improved retention rates among patients participating in the program. In another recent study, clinician-researcher Marcia Holstad and colleagues worked with a producer to write and record songs in a variety of genres focused on AIDS-related adherence. Participants received MP3 players with a 70-minute program of these songs. Between songs, a DJ posed questions to health professionals about AIDS, followed by scripted AIDS-related banter with would-be callers. In comparison with a control group, participants who listened to the music saw a decrease of HIV in their blood. But that wasn’t the end of the impact. “We had people call us after they’d listened to it asking for music videos,” says Holstad. “In our focus groups, people said they shared this music with their families so their families could understand what they were going through.” One patient used the music to help break the news of his HIV status to his family. Currently Holstad is working to convert the music project into an interactive app for a follow-up investigation. Drenna Waldrop-Valverde says that people with HIV value the opportunity to participate in research trials and to tell their stories. The clinical and research outcomes at the Ponce Center belie its limited resources. The center’s primary financial support comes from state-administered AIDS grants and the federal Ryan White Care Act, which comes up for Congressional reauthorization in 2013. In the meantime, space is so tight throughout the building that exam rooms double as clinician offices. While the building is seven stories, the top two floors have not yet been built out because of funding limitations. Still, staff and patients know that relationships are more important than the quarters in which they’re cultivated. Hundreds of Ponce Center patients choose to enroll in studies each year, in part because of the trusting, long-term relationships that they have with their care providers, many of which now span more than a decade. "Emory to receive $6 million for AIDS vaccine research"
"NIH awards $9 million to Emory CFAR"